My sis bought one and told me it's so good but I didn't believe her until I tried it out myself and.. OMG it's awesome! I could not believe my eyes when I first used it. I'm used to using metal nail files (apparently only meant for fake nails) or those red ones (you should really throw those after a few uses). It really shocked me to see something so smooth do such a good job. 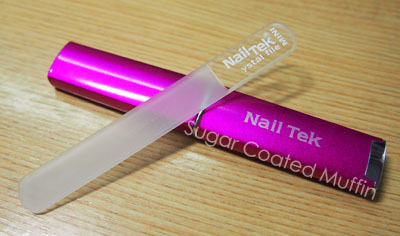 This is by Nail Tek, purchased from My Nail Solution. It's a mini sized file, originally in a set that looks like this. They sell the big one too for I think RM 70++. I've always wondered how people get such straight squarish nails. No matter how carefully I clipped mine, I couldn't get the shape I wanted. Now it's so much easier with this crystal file. I don't have proper before & after photos (regret I did not take them!!) as these are already after I reshaped my nails. I just lay the file flat on the tip of my nail and begin filing it then round the corners a little (you don't wanna scratch yourself). It only takes seconds for each nail. IMO, it's even easier to file your nails shorter than trying to 'trim' your nails with a nail clipper. Voila! Sorta straight tips lol My pointer and middle finger tend to get rounder when they grow longer so I have to file the edge to 'maintain' the shape. *Filing your nails in 1 direction is better than left-right-left-right. I find it more comfortable to file from the sides towards the middle. 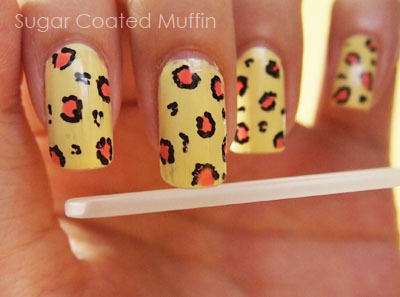 *Don't be afraid to experiment with your nail shape. They will grow..
*Be gentle. Especially if you have soft/brittle nails. A good nail file requires less pressure and doesn't damage your nails as much. Yes, it does look pretty fragile. That's why it comes with that case. And yes, it is pretty expensive but it should last a long time (provided you don't drop it) and the outcome is totally worth it! Definitely repurchasing one of these if I happen to break mine or lose it. ooh.. how much does the small file cost? I only prefer to use crystal nail files! I really love the outcome! Your nails are very cute btw. Gosh.. I really wish I can answer you but my sis was the one who bought it and I don't have the receipt. Maybe you can call the shop and ask.